The third edition of Gran Fondo cycling from Rodeo Drive is now history with the Gran Fondo Italia Beverly Hills held on the 28th of September. 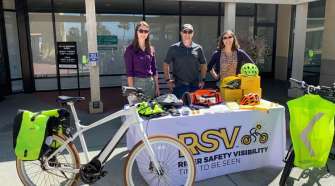 From Rodeo Drive through Los Angeles to the Pacific Ocean over 800 cyclists took part, including City of Beverly Hills Mayor Lili Bosse. 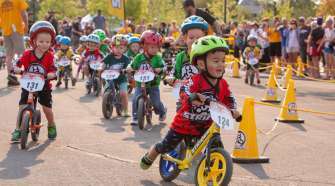 Cyclists from around the country showed how the spirit of Italian Gran Fondo has been shared by fans on the west coast of the United States. The event was one highlight for the City of Beverly Hills in celebrating its centennial year (from 28 th January 1914) and was conducted over two days, opened by an Expo in the heart of Beverly Hills: Beverly Canon Gardens. The Sunday ride in Beverly Hills started at 7 am from Rodeo Drive. A Lexus pace car, the official automobile of Gran Fondo Italia Beverly Hills, led the riders wrapped in the colors and logos of the event. 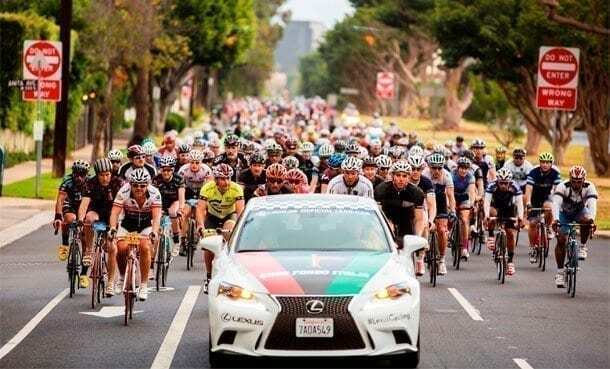 The participants held a controlled rate behind the Lexus pace car for the first 12 miles, with rolling road closures from Rodeo Drive though Los Angeles and on the Pacific Coast Highway out to the Santa Monica Mountains escorted by the California Highway Patrol. 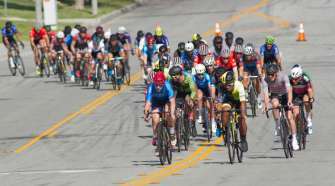 Riders on the long course took on the challenging Piuma Road, the scene of the Lexus KOM, or the “Gran Premio della Montagna,” timed section of the event for competition and awards. The timed climb began at Malibu Canyon Road and Piuma, with a timed climb of 5.2 miles and an average slope of 6 percent. The top male podium spot for the Lexus KOM was Rudy Napolitano with a time of 23’39” and the winning female was Kathryn Donovan with a time of 27’46 “. The organization of Gran Fondo Italia Beverly Hills has had the full support of the Italian Trade Commission and the Italian Consulate in Los Angeles, in addition to the sponsorship of Expo 2015. These partners reinforce the mission of the Gran Fondo Italia series: promote “made in Italy” with food, wine and tourism in addition to the passion of “Italian cycling”. Top companies in the industry have embraced the project of Gran Fondo Italia, including Colnago, fi’zi: k, Kask, Gaerne, Pissei and FSA, all participating in the Expo area of the event along with other Italian brands such as Ciacci Piccolomini for wine and Peroni as the official beer, and Cycling in the Venice Garden, a project aimed at promoting cycling territory of the province of Treviso. Finally, the lucky winner of the Colnago C60 that was offered as a prize by the famous Milanese manufacturer of bicycles: Justin Minyard. Justin is from the city of Tampa and brings home this beautiful jewel of Italian industry. Colnago participated in the event not only as a sponsor but as the leader of initiatives such as the gala that inaugurated the “Colnago Lounge” inside the Mr. C Hotel, the famous hotel founded by Ignazio and Maggio Cipriani, and in the circuit “the Leading Hotels of the World “. With the launch of the “Colnago Lounge” it will be possible for every hotel customer to try the Colnago bicycles from the house of Cambiago throughout the year.